Distributing food to kids and their families at local elementary schools. Utah Food Bank’s newest program, Mobile School Pantry, complements both school meal programs and our other childhood hunger programs. It provides a cost-effective food distribution point for children and their families at the end of the school day in a safe and trusted environment—the school playground. 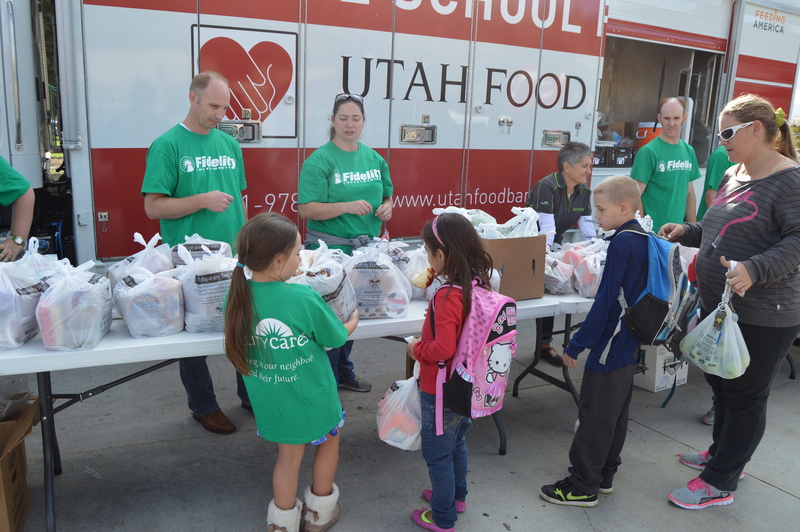 Each month during the school year, our truck arrives on the school property where Utah Food Bank staff and volunteers assist students and their parents as they sign in and receive food. The amount of food distributed varies depending on availability of donated and purchased foods. We attempt to provide as many healthy items as possible. Mobile School Pantry deliveries are only available to the students of that school and their families and are completely free to the schools and their families in need. The growth and impact of this program has been astounding—last year, through distribution at 67 school sites, we reached 304,845 individuals, 169,373 of whom were children. This year, we are serving 69 sites! The Mobile School Pantry program approaches childhood hunger with the understanding that children are only truly protected from the pain and anxiety of hunger when their whole family has enough food to stay healthy. This approach makes the Mobile School Pantry program especially effective. Teachers and school administrators report that this holistic approach creates better educational environments and a stronger sense of community among the student body and their families. Cyprus Credit Union Pride Transport Wheeler Machinery Co. If you or your business are interested in sponsoring a Mobile School Pantry, please contact Ginette Bott at (801) 887-1283 or ginetteb@utahfoodbank.org. 1 in 7 Utah Kids Face Hunger. We work to feed them all. Find out how we feed hungry Utah kids.